I rarely get my hands on classic/mainstream women’s perfume samples; I’m always receiving niche offerings — masculine or unisex. When I saw a sample tray at a department store full of the Lalique de Lalique fragrance, I got two vials, thinking I’d pass one on to someone I know who loves old school women’s perfumes and I’d keep the other to use in my scent infuser — IF the fragrance appealed to me. 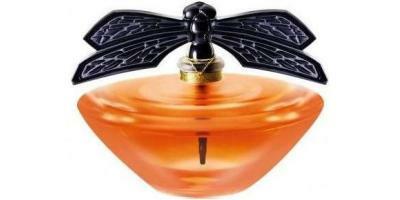 Lalique de Lalique has a confusing history; it was originally called Parfum Lalique, was developed by perfumer Sophia Grojsman,* and was released in 1992. 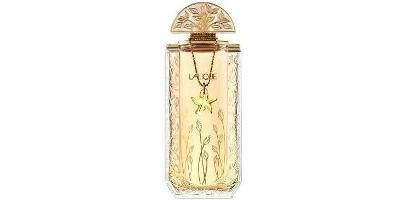 Parfum Lalique was repackaged, renamed Lalique de Lalique, and, perhaps, reformulated in 2001. Reading my sample card, the perfume I’m reviewing is an Edition Spéciale, 20th Anniversary (“special edition” refers to the bottle, not the perfume, I believe) that came out in 2012. I have no idea if this is yet another reformulation. Lalique de Lalique, as it smells today, opens with bright rose and soft, almost powdery iris. Its fruits are “cool” with hints of pear and muted cassis, nothing too sweet or cloying or that will remind you of a celeb-u-scent or teen perfume. Lalique de Lalique’s dry down smells of expensive cosmetics (I’m thinking vintage face powders and lipsticks). Yes, as a child, when I wasn’t smearing those products on my poor sister’s face — in frightful ways —I was sniffing the powders and lipsticks. For its finale, Lalique de Lalique presents a diffuse mélange of almost "crumbly," talc-y musk, sheer vanilla, and residual fruit and floral notes. Perfumes like Lalique de Lalique are not challenging to wear, or to “interpret” (unless you fear seeming out of date or being judged “conservative” by those who smell you); and Lalique de Lalique, no doubt, seems old fashioned to many, but on the rare occasions when I smell perfumes of its type, I realize I miss old-style, rather complex, intensely feminine, floral perfumes — perfumes that remind me of special occasions: weddings, the opera, or fancy parties. Lalique de Lalique Edition Spéciale, 20th Anniversary Eau de Toilette and Eau de Parfum are available in 100 ml ($149-$171); Lalique de Lalique Edition Spéciale, 20th Anniversary Parfum is also available in a 100 ml numbered and signed crystal flacon called “Libellule” ("dragonfly," image at the top of this post), $1,800. Check out the Lalique webpage for a complete viewing of its beautiful limited edition crystal flacons. *Listed notes are: iris, rose, jasmine, clove, blackberry, cassis, pear, white musk, sandalwood, vanilla. Kevin, I had to smile about your young adventures in cosmetics. How sweet! I used to make up my boy cousins’ faces since they were the only playmates my age until I started school. Is Lalique de Lalique in the same vein as Love, Chloe, Poudre de Riz, Balenciaga Paris etc? If it is, I’m sold! Do they produce standard issue bottles (as if I’ll ever be happy with one considering the gorgeousness of that dragonfly)? AbScent: if you love those three you should try this; and the bottles!… Follow the Lalique link at the bottom of my post to check, but I believe the ‘simple’ bottle is the one near the end of the article. I think the standard bottle is similar to the lower one – it has that sort of top – but it doesn’t have the starfish hanging off and the lower bottle is plainer. That dragonfly bottle is just beyond beautiful. Mals86 The Buddha bottle is nice too…lookiing at that led me to this in a round-about way…Lalique de Lalique wasn’t on my radar and then I saw it at a store. Hope you like it. I don’t think I’d call this frag intensely anything! But, it is very pretty – and delicate (if I remember it right). What I remember liking the most is this warm, silky wheaten dry down it has. I’m not sure what wheat smells like, but I imagine it a little like this. Anyway – need to try it again! Does anyone have a good idea of the difference between the EDT and the EDP? Sorry Kevin, I didn’t mean to contradict you! I agree that it is intensely feminine in a very refined way. What I meant is, I don’t think its intense in a voluptuous womanly sort of way. You sure? comes a squeaky voice from the figure cowering in the corner with hands protecting face! Merlin: how long ago did you try it? l tried it a few times last year; and liked, but didn’t love it. I’v discovered my skin actually negates most perfume almost on contact so I need to try it again with some petroleum jelly smoothed on underneath. My skin chemistry may well have made it even more ‘delicate’ than it really is! Also, I’v been wondering if that ‘wheat’ association doesn’t come from the colour of the perfume together with those little leaves worked into the glass…. The notes sound interesting, Kevin! Which department stores carry this line? Hajusuuri: Check out Neiman Marcus for starters. I love the old Lalique, 1992. I know it’s not popular, but I wore it for years. Love the dragonfly bottle and the anniversary bottle! This is a great bottle. I wonder if they’ll do a mini, also. The bottle I really love, though, is Ondines. Noz: wow..that bottle is quite a production! A fan of both Balenciaga Paris and Lalique’s own range (scarcely can a complete outsider company have made such an intelligent move into parfumery) I am very tempted to by this. I too long for the day when fragrances were complex, flowery ‘event statements’ rather than the squashes and candy floss of much of today. As soon as I saw “dry down smells of expensive cosmetics”, I wanted to try it right away. Thank you for this review! A few Lalique perfumes are new to HSN right now. I had never heard of this designer perfume. So I started searching the web and that’s how I found this site. I have read really good reviews and a few not so good. They had a trio of three miniature bottles that were sold 2001 and after and in one day Sold Out at HSN. Retailed $100 were sold for under $40. Thank goodness I grabbed one obviously a lot of Lalique lovers. They are selling Amethyst, Lalique and one other in large bottles at prices over $100. You can also buy the body creams and body wash. Will update in a week can’t wait to sniff my perfume.